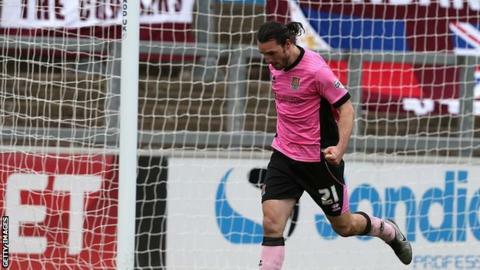 John-Joe O'Toole says League Two leaders Northampton cannot afford to let up in their pursuit of promotion. The Cobblers are 21 points ahead of fourth-placed Accrington Stanley, with 11 games to play, following the 4-1 win at Carlisle United. O'Toole, 27, has now scored 10 goals this season following a brace against the Cumbrians. "We need to keep going, keep grinding out results," he told BBC Radio Northampton. "However we do it, whether it be horrible or whether it be silky moves, we've got ourselves in a good position and we need to see it out now." The midfielder, who joined in June 2014, was told he could find a new club at the end of last season, just 10 months into a three-year deal. But he was removed from the Sixfields transfer list in October and has became a regular starter for Chris Wilder's side. "I'm delighted by how it's panned out - that's football for you," said O'Toole. "I like to think I took my chance when it was given."